For all of you homemade cocktail makers, Drinks Over Dearborn (one of the only places in the city to find truly rare and unique cocktail ingredients) is threatening to go under. Help support them by pledging $100 to set up an account at the store -- your investment is guaranteed, gets you a discount, and helps preserve cocktailing in the city. They need your help! jsagoff wrote: For all of you homemade cocktail makers, Drinks Over Dearborn (one of the only places in the city to find truly rare and unique cocktail ingredients) is threatening to go under. Help support them by pledging $100 to set up an account at the store -- your investment is guaranteed, gets you a discount, and helps preserve cocktailing in the city. They need your help! I was thinking about posting this as well, I'm going by after work today to set up my account. I know this is a TVH-related forum, but I'm going to submit one of my own creations from last night that I really enjoyed. 1 oz lavender syrup (I acquired the dried lavender flowers for steeping from The Spice House on North & Wells). shake and strain first three ingredients over ice, then add rose water with eyedropper or similar instrument to top of cocktail before serving -- make sure you get this one really cold. It's also super pretty! Just wanted to share a few pics of some TVH cocktails I've made. Wow those are beautiful pictures! Excellent ice shards. Do you refreeze your shard for use another day? Nope-- once the drink was finished, the shard had shrunk considerably. But I do make large blocks that I keep in the freezer, so I can carve out a shard or iceberg whenever I want! Wow, I'm impressed by your efforts to replicate the ice shard. Do you buy a block or do you make the ice yourself, too? If it was DIY, what was your technique for the clarity? This is one beautiful drink. nothing special for clarity, just fill a tupperware container w/filtered water and freeze it! I have been working on doing a proper Margarita for a long time, and have tried Toby's variation. My favorite is the Salpicon variation. As this is a common and often requested summer drink, here is what I am doing. The Agave syrup is the "secret" ingredient, and produces something totally different than simple syrup. You may find you want to do a little less Agave if this is on the sweet side, depending on the limes you have. Interesting article I ran across today: "Bad Idea of the Day: Copyrighting Cocktails"
I just got visitied TVH after a little hiatus and i must say the new menu is very well done. i dont remember seeing a "potable bitters" section of the menu before. How long has it been there? In that section I tried the pimms variation and Eeyore's requiem. Toby, can you give us the proportions for this lovely drink? thorough wrote: I just got visitied TVH after a little hiatus and i must say the new menu is very well done. i dont remember seeing a "potable bitters" section of the menu before. How long has it been there? Eeyore's has been on the menu since spring, but the Potable Bitters section debuted in April of '09. You are exactly right on the specs, you just forgot the garnish which is heavy orange oil and then a pigtail twist. And I might even say it's even a skinny .25 of Fernet. It's funny that the Eeyore's Requiem is the most talked about drink after the J&R. Oh, how our palettes have changed in the last few years. Alchemist wrote: It's funny that the Eeyore's Requiem is the most talked about drink after the J&R. Oh, how our palettes have changed in the last few years. I blame the Paper Airplane...that drink absolutely destroyed my conception of what I appreciate in a cocktail. Then it salted the earth where that conception had previously stood. I second the Paper Airplane as a game changer. For those who don't know, Eeyore's appears to be served up, coupe, and i am guessing it's stirred with 5 KD cubes for 30 or so? I had posted this in the dedicated Hum Spirits thread (short though it is), but it occurs to me that the lively contributors to Homemade Violet Hour might have more thoughts. 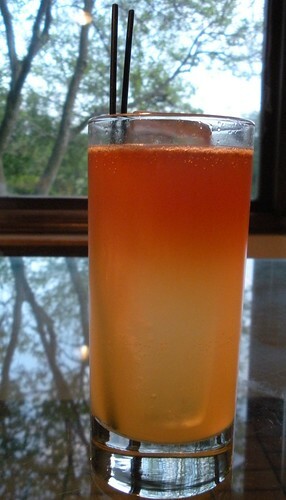 I recently received a bottle of Chicago-based Hum spirits (a rum with hibiscus and ginger, among other things), and would love your ideas for an autumnal cocktail incorporating it. I'm thinking of perhaps lightening it with champagne or prosecco, but curious about another element to add...Thanks! Pre-bottled two Violet Hour classics for a party this evening...the Harlan County and the Briar Patch. Basically took the recipes and multiplied by 8. 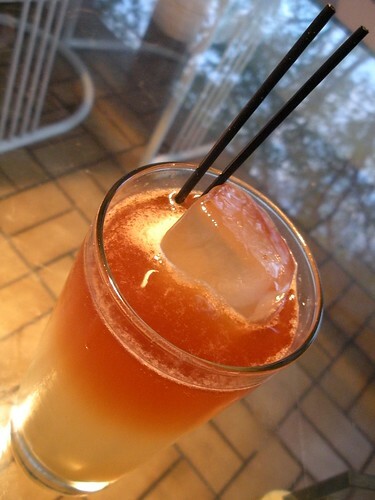 Normally this drink is shaken very briefly, and is served on crushed ice to properly dilute. I don't have a good supply of crushed ice, so I'll shake this one to order, 3 oz of mix for a hard 15-seconds or so, and serve the drink on the (now cracked) faux-draft garbage ice from the shaker. I'll shake 4 oz of this to order with a dash of Bolivar Bitters (by Bittercube, kinda similar to Angostura but lighter/fruitier...at the Violet Hour, this drink gets Tangerine Bitters) and strain. My wife and I visited TVH last week, and I had the two best cocktails of my life: the Baron's Brew and the Corpse Reviver #2. Is there any way you could post the recipes to these? I've been on a hunt for the Corpse Reviver #2 ingredients, as it looks a bit less involved than the Lady Grey infused Beefeater. Nonetheless, I'd love to have the exact recipe used at TVH to replicate the drink. We'll be visiting again soon! Shake, strain. Garnish with a cherry, or orange peel. Thanks, so much. I have tried several Corpse Reviver #2's, but none compared to what I had at The Violet Hour. So, I was hoping to find out what spirits they used for the drink (as well as the Baron's Brew). Gin, the ones I see being poured most are Plymouth, Tanqueray, Bombay and Death's Door and Hayman's Old Tom. Of those, I 'like' Death's Door the most, however they all have different flavor profiles that work in different drinks. That being said I'd go with Death's Door, or Hayman's Old Tom. Old Tom gin is a sweetend gin, that's mostly used in classic drinks. Don't be confused with Ransom Old Tom which is more like a genever than an Old Tom. I've seen references to Corpse Revivers with the older styler Old Tom, but if I wanted a more 'modern' gin, I love the soft deliciousness of Death's Door. Lillet, this one is almost certainly not poured with Lilet Blanc at TVH. I've always seen them sub out Americano Cocchi, which is supposed to be the same flavor profile of what Lilet Blanc was before they reformulated in the mid 80s. It has more of a complex flavor with the addition of the the bitter quinine. Cointreau, I've rarely ordered anything at TVH with Triple Sec/Curacao, however, the one time I noticed I saw Marie Brizard Triple Sec being used. I've not seen cointreau, but that being said, cointreau is delicious stuff so I think you are fine there. Lemon juice. I'll leave you to your own devices on this one. Absinthe, I normally see Herbsaint used in place of absinthe at TVH. New to the forum....I'm a big fan of TVH cocktails and have had some mild success in replication (they just never seem exactly the same!). However, one thing I need to improve on is presentation....I love the cocktail glass at TVH, but can't seem to find anything like them. I have found plenty of good ones, but they are always a bit on the big side. Anybody know what brand of cocktail glasses they use (for drinks like the Willing Hostage)? jdg2 wrote: I'm a big fan of TVH cocktails and have had some mild success in replication (they just never seem exactly the same!). It's almost always down to two things you can't easily replicate at home, the ice and the bitters. 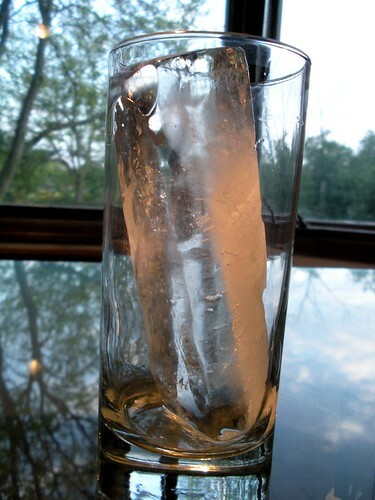 Lots of folks go crazy trying to recreate the bitters, but the ice is the far more important of the two, in my opinion (not that the bitters aren't great, they are, but your oven is more important to a recipe than the variety of salt you choose). jdg2 wrote: Anybody know what brand of cocktail glasses they use (for drinks like the Willing Hostage)? Up drinks? It's a Libby 5.5oz Champagne Coupe. Links here. Along the lines of the ice, has anyone tried the classic cubes from Lang Ice? They're larger than normal cubes cut from block ice. Marketed as melting more slowly than normal ice. I have a recipe request: My favorite cocktail at the Violet Hour is the velvet fog, but last week when I was there, the bartender barely remembered how to make it! I would be very sad if I could never have a velvet fog again, so would you please preserve the recipe here for posterity? hushandwonder wrote: I have a recipe request: My favorite cocktail at the Violet Hour is the velvet fog, but last week when I was there, the bartender barely remembered how to make it! I would be very sad if I could never have a velvet fog again, so would you please preserve the recipe here for posterity? Also, how much constitutes a 'sprig' of mint? We had some debate about this. A sprig is usually a cut of plant that's one cut out from the smallest. So instead of a leaf, a cluster of leaves. I recently went to the Violet Room and had a muddled cucumber martini. I would love the recipe. I think it was cuc, mint, lime muddled and lavender or rose simple syrup. It was the favorite drink at the table by far!! !